Well, that's the idea anyway. I've been working on this one for years and didn't want to post it until I felt that I'd mastered it. That came sooner than expected this year, when I switched to using pullman loaf pans and things got immediately easier. I studied abroad years ago in southwestern Germany, where Spelt bread (aka Dinkelbrot) is very popular. I was given a recipe for a no-knead, 100% whole grain sourdough spelt bread while I was there. Over the last few years I've been trying to perfect the recipe by making it simpler, more full-proof, and easier to fit into a busy lifestyle. The last batches I've made are the closest I've come to reproducing the Dinkelvollkornbrot from my favorite bakery in Stuttgart . Begin by adding (per loaf) 600g of whole grain spelt flour, 15g salt and 3g guar gum  (optional, see notes) to a mixing bowl. EDIT: I now use 20g of ground flax seed per loaf in lieu of the guar gum). Take your sourdough starter out of the fridge and mix it in too. I don't measure the starter but it's usually about half a cup . Add 600g of hot water (I run my tap until it's hot) to the bowl and mix until combined. If needed, add extra water to hydrate all the flour without resorting to kneading - I usually end up adding 50-100g extra. But I would start around 100% hydration and go from there. Once the dough is mixed, take a cup or so of it and put it back in your sourdough starter jar. Put it straight back into the fridge. 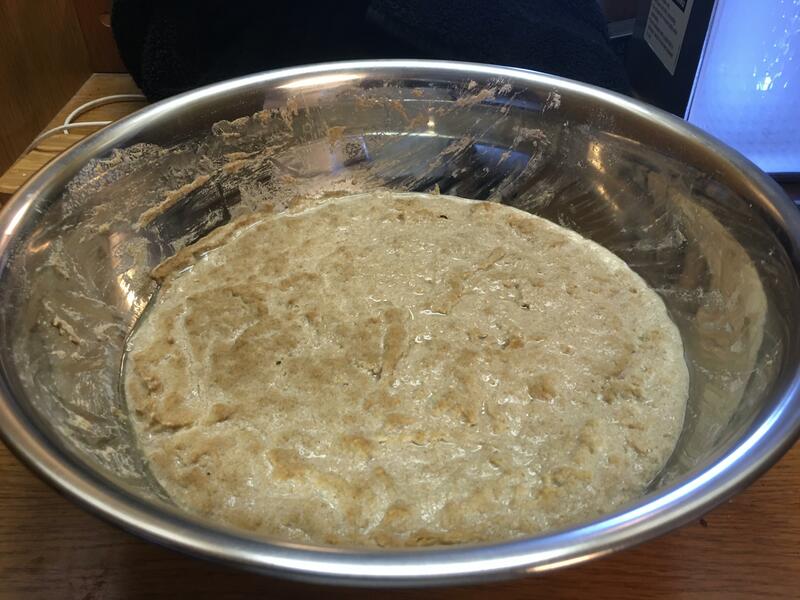 It'll ferment and be ready for your next bake. As long as you bake at least once a month, this is all the sourdough maintenance you'll need to do with this recipe, no need to feed your starter. Now, cover with a towel and go to work. Or go to bed. Or, whatever. Just give the dough 8-15 hours to rise. The dough will be waiting for you any time within that time period. How long you wait will effect on the level of sourdough flavor in the final product, but the effect is minor and I worry more about my schedule than the flavor. Whenever it's convenient, move on to the next step. After the long rise, the dough should have risen quite a bit (maybe close to double in volume). Optionally add 35g of sunflower seeds and 35g of pumpkin seeds per loaf to the bowl . Stir well and remove large air bubbles. This should only take 1-2 minutes, don't get too enthusiastic and start kneading. 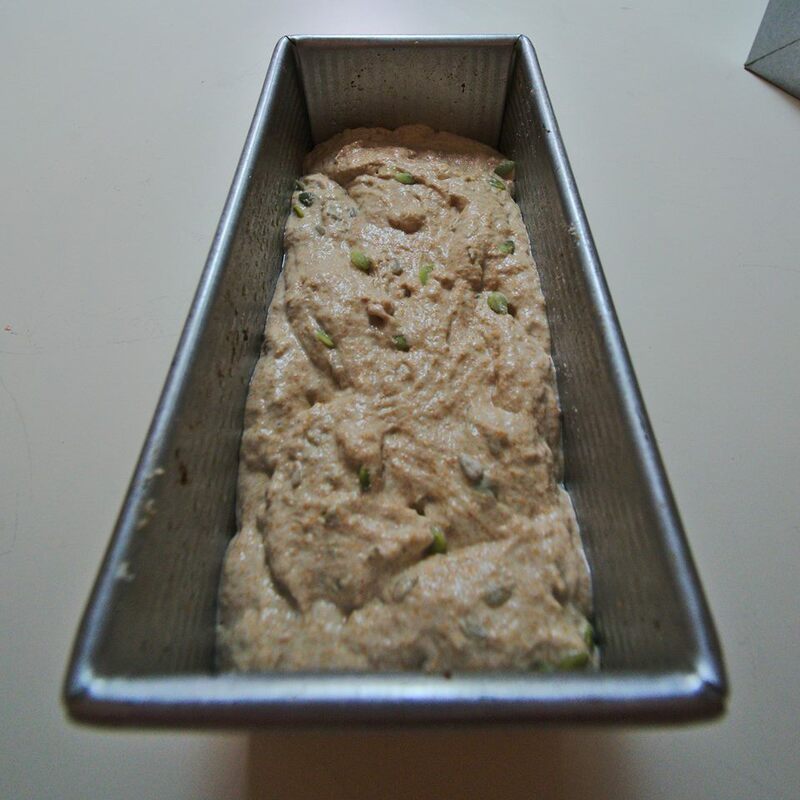 Now grease your loaf pans (I use an oil mister, because it's easy and fast) and divide the dough between the pans. It should be far too wet to shape, so don't even try. Let it rise about an hour before putting it in the oven (with the lid on, if you're using a pullman pan). This step is where the pullman loaf pans really come in handy, because they have a lid. The tight-fitting lid results in more predictable oven spring, which gives you a much bigger margin for error when proofing the dough. I have yet to underproof or overproof a loaf when using these pans. Even when I was sure I'd screwed up, the loaves turned out fine. With regular loaf pans I found that the optimal window of time to put them in the oven was very, very short. See notes for more on this, plus tips on using a regular pan with this recipe . Once the bread has proofed, put it in a 420 degree oven. I then bake it for an hour, in my oven at home. Take the bread out of the oven, place onto cooling racks, and wait for it to cool. For best results, wait overnight before starting on the loaf. Then slice thin and enjoy! The bread will last a long time - at least 10 days. It's great for open face sandwiches with cheese, cold cuts, or other spreads. Or for PB&J (I may love German bread but I'm still American...). Or, you know . . . butter. Open face butter sandwiches. Is there anything better? I've also made a version with white spelt flour, for making grilled cheese and BLTs. That one's a work in progress. I'm going to try adding potato water to soften up the crust next time. And I have yet to master the rye version as well. But this whole wheat spelt version is good and consistent for me now. They also make a 13" long version, which would be more economical if you're trying to maximize the amount of bread made per dollar spent on loaf pans. But I like the shape of the 9" loaves better. Hafendoerfer, for those who are curious. If you *ever* get the chance to go there, do it! It might be the best bakery in the entire country of Germany. Definitely the best in Stuttgart. The guar gum improves the texture when used in small quantities. Using much more than this will result in an unpleasant gummy, bouncy texture. The loaf will be fine without it, but won't hold together quite as well. EDIT: I now use 20g of ground flax seed per loaf instead. It works just as well as the guar gum, plus it's good for you! By having a long initial fermentation, there's no need to have an active starter. It'll have several hours to wake up and get going. I've used starter straight from the fridge that hadn't been fed in a month, and the bread rose just fine. Using hot water also helps kick-start the fermentation. I *highly* recommend adding the seeds, they do a lot for the texture and flavor. They also tone down the fluffiness of the bread and make the crumb more authentically German - I found that my bread was rising a bit too much without them. If you omit them, you may find that 600g flour makes a bit too much dough for a 4x4x9 pullman pan. With a regular pan, I found it really hard to figure out the ideal time to put the dough in the oven to get a good rise. Overproofing results in a lot of oven spring, but then the loaf collapses in the oven. Underproofing results in the crust rising above the crumb, and a cavity between the two. Or weird shapes bursting out of the top of the loaf. I found the sweet spot between the two to be short and hard to catch. There may be other solutions to this problem - adding steam to the oven might help. Or you could put a sheet pan on top of regular loaf pans and put a skillet on top for weight. But the pullman pans work for me and I like the size of the loaves they make. I spent years trying to figure out the proofing stage of this recipe and I finally feel like I've figured it out, thanks to the new pans. If I'm using a new oven, I'll bake for 45 minutes, then remove the covers off of the pullman pans and stick a probe thermometer into the center of one loaf. I then continue baking until the center reaches 205-ish degrees Fahrenheit (I live at 7000 feet elevation, so I actually go to 195, but at sea level you'd want 205). Once I've figured out the oven I don't use the thermometer anymore and I just set a timer. Ground flax,psyllium or chia seeds may provide the structure needed if you want to go to a less refined product than guar gum. It would be small amounts (prob no more than a teaspoon or so of psyllium, maybe 1/2 tsp chia and a bit more of the flax (up to a tbsp.). This would take some experimentation. do you know if a tbsp flax is so many grams? i want to replace some of these other seeds with it if possible. though i am unsure how and i know the dosage matters for omega oils and too much can be laxative.i am so curious. I finally got around to trying the ground flaxseed instead. I used 20g per loaf and that worked quite well, 10 or 15 would probably also work just fine. No more guar gum for me! the crumb right. This is a very nice 100% hydration 100% whole grain spelt SD pan bread for sure. Now you can move on to Michael Wilson's challenge bread of the the same recipe only using slap and folds and no gun or pans,:-) It is fun just to give it a go. would you recommend so many grams for an eyeball 1/2cup starter? 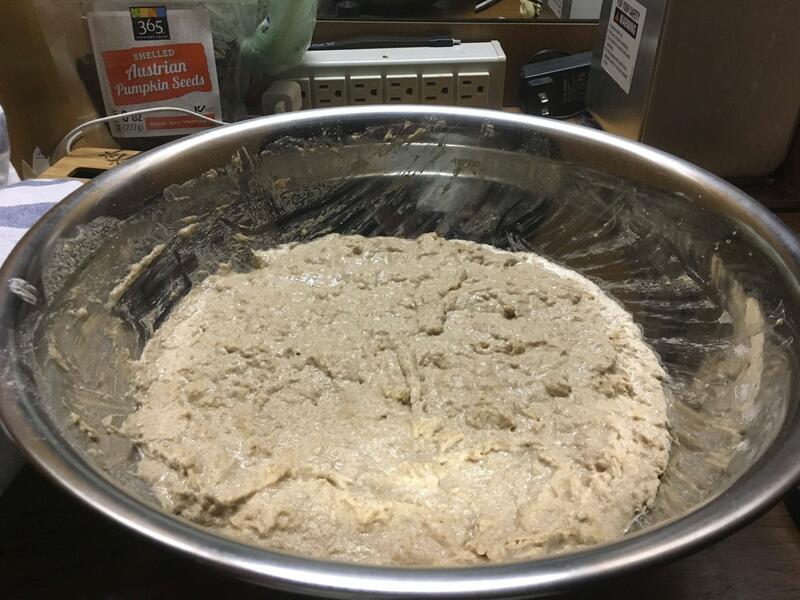 if i suceed and i want to do this again, can i use a levain build to make a 1/2cup starter from your NMNF starter? if so , how? i was asking if active starter would be ok or not. 140 g and that is the amount of starter you need. I say use 150 g since that easier to remember. 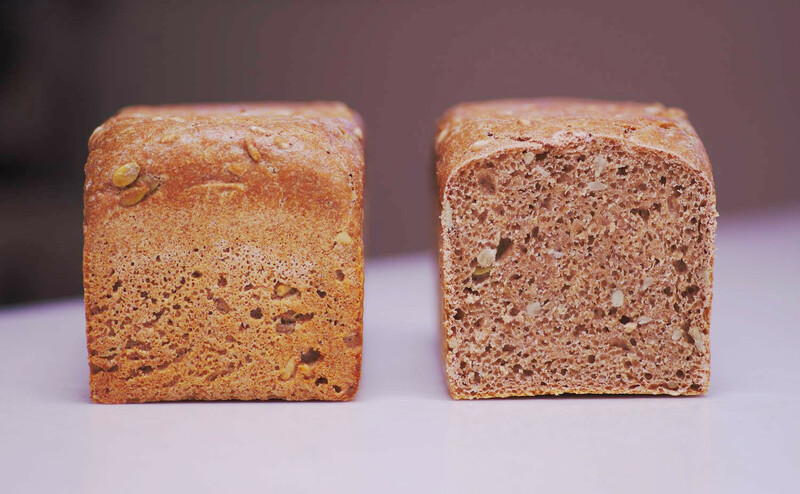 Use the rule of 15 to figure out the 3 stage NMNF levain build.......... 150/15 = 10 g . So use 10 g each of starter, flour and water for the first build. 20 g of flour and water for 2nd and 40 g of flour and water for the 3rd build 30+40+80 - 150 g of starter. That's a good point, I haven't actually tried the recipe without guar gum in quite a while. Maybe I'll do a controlled experiment. I have 4 pullman pans now so I can make two loaves with and two without. I bake once a week or so and give two loaves away each time. It doesn't really bother me to use the guar gum and I use a pretty small amount. I've thought about adding flax seeds anyway for health reasons, just need to find my spice grinder... so maybe the flax would take the place of the gum. The Michael Wilson challenge recipe I could only find references to online, but not the original post. Might be fun to try at some point. Right now I'm working on the rye version of the recipe and trying to perfect that. I made it with rye once while traveling in France, and it came out incredibly flavorful and sweet. Also incredibly sticky, despite putting it back in the oven for an extra hour (!). I have been wanting to reproduce it (but hopefully without the stickiness) ever since, but haven't managed to make anything close. It was something else. The most delicious bread I've ever eaten, but coated the bread knife with crumb when you cut it. Unusable without toasting. Crumb was almost purple. Same basic 100% hydration recipe as this, so I'm guessing that it was the particular type of rye flour. hydration that isn't sticky you let us know and make sure to patent it too! It is going to be moist when you slice it if you bake it to 205 F. Such is the nature of rye breads. Well, I have no idea what temperature I baked that loaf to, that's part of the problem. I was traveling, so I went by time. Then baked some more because it was sticky. Not sure if I had a scale or not, I don't recall. But in any case, sticky is almost not a strong enough word for what this bread was like. The coating of crumb on the knife was about 1/8 of an inch thick after a couple of slices. I made a loaf of 100% hydration rye last week and it was nothing like it. Unfortunately it didn't have the incredibly sweet flavor of the loaf I made in France, either. I need to try some different kinds of rye flour, I think - I just used what I could find at the local natural foods store, which was Arrowhead Wheat Rye Flour. I’d like to try this with a combo of spelt and rye ... maybe half and half ... to help offset the stickiness of the rye (and just because I need an excuse to buy a Pullman pan!) Great recipe - thanks for posting! Really nice post, both the bread and the write up. Would you mind if I featured this on the homepage for a bit? Sure thing! I'd be honored. and so glad the write agreed. i would have never had the time to search for this. what a gem! Thanks for posting this! Beautiful loaf too! This is so different than what ive been trying. i am excited to try it and i think i actually understand it all. you rise for an hour with the lid on and it doesnt matter how much it rises right? so it finishes rising in the oven? do you also bake it with the lid on? if you dont mind-for the flax, do you think it cant hurt if i want to try flax in place of guar gum? only 3g flax or can it be more? if i do use an active starter, will it still work? i do have some discard spelt starter, some a week old and a few others sat around from last month so i guess it ok to use them for this? I am so excited by this! I have the same 9" pullman pan and i am so excited to not have to ask people for math! do you really think its ok to eyeball the starter to half cup, is it worth mesuring if i want to? mine usually feels like i loose some sticking to things. this sounds so great, i wonder if i will suceed to have a non gummy loaf like you. beautiful! i just saw the part about baking for 45 mins with the lid. i have a oven thermomoter but am unsure about its accuracy because it has been so low. when i try 425, i dont even see 300f. i am trying to figure this out. but i did see maybe 202f when i used a probe and thought it wasnt ready, looking wet. so maybe i can use a lower temp than 208? i doubt my bread was done anyway. what is the lowest temp i canbake this at 350? and if so bake it longer? and can i use sunflower seed in place of pumpkin so double sunflower? i just saw you think it absorbs the extra moisture. i prefer for the longterm not to do this only because i worry about the high temp effect on the seed oils but maybe its ok and we will love the extra protein. maybe the seeds will partially ferment? i wonder if it could be 1/2 sunflower and 1/2 flax. i am curious how much flax per loaf to ensure omega oils in each slice of bread. i hear flax is much more resistant to the heat and feel good about that. Yeah, I let it rise for an hour. If it were really cold I would consider going longer. It will rise quite a bit more in the oven, it only fills the pan up about halfway before putting it in the oven. I rise (and bake) with the lid on. By active starter you mean one kept at room temperature and fed frequently, right? In that case I would just use a smaller amount of starter, maybe a tablespoon or two. Flax instead of guar *should* work. I still haven't found my grinder so I can grind up some flax seeds and try it out. I would use much more than 3g for the flax - maybe 20-30g? You can measure the starter if you want, but because of the long room temperature rise, the recipe is very forgiving in that regard - it will rise fully in a few hours and the rest of the time is just developing sourdough flavor, so changes in the amount of starter will just change the amount of sourdough flavor. You could definitely do double sunflower. I don't think it actually absorbs moisture out of the dough, but it definitely makes the bread a bit more dense by weighing it down. You could also mix the sunflower seeds into the dough at the beginning, and then they might sprout or ferment a bit during the long rise. I think 1/2 sunflower and 1/2 flax would work fine. Given your thermometer issues, I think I would just try it out and see how it comes out. 1 hour rise in the pan, 1 hour bake at 425. Unless your oven thermostat is totally wrong, that should work ok. I converted it to dabrownmans NMNF style refridgerated starter. Its very small and concentrated and I have been using it to make a levain build while trying some of my first loaves. I am new to keeping the starter and I still dont understand it all. I actually need to figure out how to refresh mine soon. If I were to use a few tablespoons that might make sense but usually I have been starting out with a 1Og -19g "seed". But----I now have some spelt discard. So if I use it then it sounds like I can put some back into the fridge and keep using it. :) Great. Easy sounding. Maybe then I wont need my other starter for this recipe. I do wonder if adding flax into what will become the starter diacard is normal, just because it has something other than the flour&water. I find it interesting. Its 600gflour and water per 9x4x4 Pullman pan right? You say divide the dough but also you say 600g per loaf. Maybe you were making more. thanks to you. i wasnt confident to invest in pans i felt i can not use. bu this truly is easy. i am getting ready to buy those pullman pans, for the larger size, how much for the recipe increase? also, what size container might be need to have the dough sit in the bowl while waiting to go in the pan? i wan to get a bowl big enough to hold 4 loafs worth, one of the pullmans is the 9x4 and then 3 of 13x4. do you think putting them all in together is a good idea and then later separating them? or is it better to not disturb it? i dont want to run out of air space. one time i tried it it didnt rise as much and other it filled my large rubbermaid container pretty well. with an increase in size, is there a way to actually accurately determine what size container i will need. ? and any suggestions for economcal containers to do so? so that i can get plastic containers to fit that amount, and then how to account for the rise. Basically, I am scrambling for a solution to get the right tools so I can go home and grind up more grain. I think one container for say 3 large loaves would have to be pretty big. Maybe 3 is better? Suggestions? Advise? my pans have arrived and i am anxious to use them so I am writing again. Is there math behind this 9" 600g recipe? i can guess maybe double 600 is 1200g so then halfway to 1200 is 900 and then a little less so maybe 850g flour and water? and then seeds maybe 50g each? Can someone help? I'm on the road so this will be a quick reply but you can divide each ingredient by 9 and then multiply by 13 to get the amount for a 13" pan. So 600 divided by 9 is 66.6, then multiply by 13 to get 867 (rounded). You could probably do 900 for a nice even number and it would be fine. I like the simplicity of your recipe & routine but I just want to know if the salt in the sourdough starter affects the starter at all? I've never noticed a problem with the salt. It might affect it slightly so if your recipe has faster rise times then you might have a problem. But with a long initial rise like this recipe has it doesn't matter. There's plenty of time for the starter to get to work so the margin for error in the starter is bigger. Hence why throwing starter straight from the fridge into the dough is just fine. Unfortunately I've seen very little rise over the last 10 hours. Nowhere near double. maybe 1/3 increase in volume. I added 1/3-1/2 a cup of my starter, which had been at room temperature being fed 1x a day for 2 days. Could it be that I didn't develop enough gluten during the first mixing stage to trap the air released by the yeast? I am using One Degree sprouted whole wheat spelt flour. I am going to wait until it's been 15 hours and follow the recipe and see how it turns out. Thanks for posting this. I am excited to eat some German bread. Was born/grew up in Munich and miss german bread a lot! How did this bread turn out? How did this bread turn out? I have a couple thoughts about what the problem might be. 1) Temperature can have a big effect. When I lived in a house that was really cold, it took more like 24 hours to rise. 2) The sprouted spelt flour might not work well for this recipe. Fortunately, because all of the flour in the recipe is soaked for 10 hours or more I don't think you need the sprouted flour from a health standpoint. I save sprouted flour for things like pancakes that aren't soaked or fermented for a long time. I don't think gluten was the problem - I hardly develop any gluten at all during the initial mix. In fact it should do it on its own, after the first rise it's always noticeably more developed than when it started. Next on my list of things to get. Great article, wonderfully written and photographed - things right up my alley. My wife's twin was a certified baker in Langenau, Germany (Swabia). Last time we visited we had Dinkelbrot with our Vesper; Butter, Ham (Schinken), Landjäger, Senf, various Käse- the usual suspects. My Frau enjoys it toasted with butter and Nutella, although she'd chose a Laugenwecken over Dinkelbrot any time and twice on Sunday. The pumpkin seeds really make it perfect, well done. and I have seen this in both Germany and Austria... is...why make 100% Dinkel loaf resemble a brick when it doesn't have to be? A little kneading during mixing and a little folding later on will result in more gas trapping in the matrix resulting in more spring. Please excuse my ignorance but would rather have a Dinkel-Laugenwecken over this type of heavier Dinkelbrot any day of the week. A girlfriend of mine who can only tolerate spelt bread was surprised that I could easily make a loaf that was like any other whole wheat bread. So why isn't it being done? Perhaps a prominent person preferred it this way and so it became popular or perhaps forgotten batch of dough became a new style of bread? I'm just puzzled about it. Spelt needs time to absorb water but once absorbed it's a beautiful flour to work with, has plenty of stretch, almost too much, and has a much better taste than it's modern wheat counterpart. I simply don't get why anyone would want to wear the dough out to exhaustion. Any ideas? I think it's mostly personal preference, and it really depends on what you're using the bread for. Bread with a denser crumb is great sliced thin and used for open-face sandwiches. I slice this bread about 1/4" thick or a bit thinner, or 4-6mm. Then I add toppings like butter and cheese, salami, mayo and grated carrots, or PB&J. For that use it works really well and a thinner bread wouldn't hold up the same way (and would have larger holes when sliced thin through which spreads could drip through easier. Also, I'm averse to even a little bit of kneading. The unfortunate truth is that my time is extremely valuable at this point in time (small business owner and doing some writing projects on the side). If I was kneading and folding the dough I doubt I'd be baking every week like I am now. That said, this bread will rise significantly more without changing the techniques at all, if you just remove the seeds and reduce the flour weight. This dough scaled to 500 or even 450 grams of flour can fill a pullman pan fully if you remove the seeds or reduce the amount. I also use a 4" steam table pan (1/4 size) sometimes for baking, with a baking sheet on top as the lid. I may try to make a spelt sandwich recipe for that pan, with fewer seeds so it rises more and also baking at a lower temp for a softer crust. But the intended use of that bread would be totally different than the one in this thread. Lastly, I'm not sure what you mean by "wear the dough out to exhaustion"? It seems to me like this method is very gentle on the dough, with no kneading and a long rise. The main thing keeping the crumb as dense as it is is the weight of the seeds. Thanks for the recipe, SMO! I just came across it while looking for something else. I've made 100% rye vollkornbrot and loved it and have wondered if a similar bread could be made with other grains. I apologize if I just missed this in the text, but does the 600g of spelt flour etc. make 1 or 2 pullman loaves? The instructions say 600g flour (per loaf) but further down in the instructions you refer to pans (not pan). Thanks! Wendy,600g will make one 9"
600g will make one 9" Pullman pan. I usually bake multiple pans so I accidentally used the plural when writing the recipe. Thanks for the super speedy reply! I can't wait to try your recipe. I have only recently come across your article and pictures of a loaf which looked so good it went straight to the top of my next bake list. I started by fulfilling an old long time "must have" wish by buying a pullman pan and then set to work on your "Dinkelvollkornbrot" style loaf. Well it was the easiest bake ever. Following your recipe exactly produced a result very similar to your photograph, and with an added layer of sunflower and pumpkin seeds on top it is delicious. It will now be a regular on my "what'll I bake next list". So a big thank you for sharing it. My experience of trying to bake a similar loaf in rye has also resulted in the knife thickening experience that you mentioned above. You have said that you are workng on a Rye version. Any results yet? If so I'd love to try it. I was intrigued by T. Fargo and Mini Ovens remarks about preferring Dinkel-Laugenwecken to Dinkel-Volkornbrot.. I did a search of TFL looking for a recipe with no results. Does anyone have a recipe for Laugenwecken they could recommend or would be willing to share? Thanks! 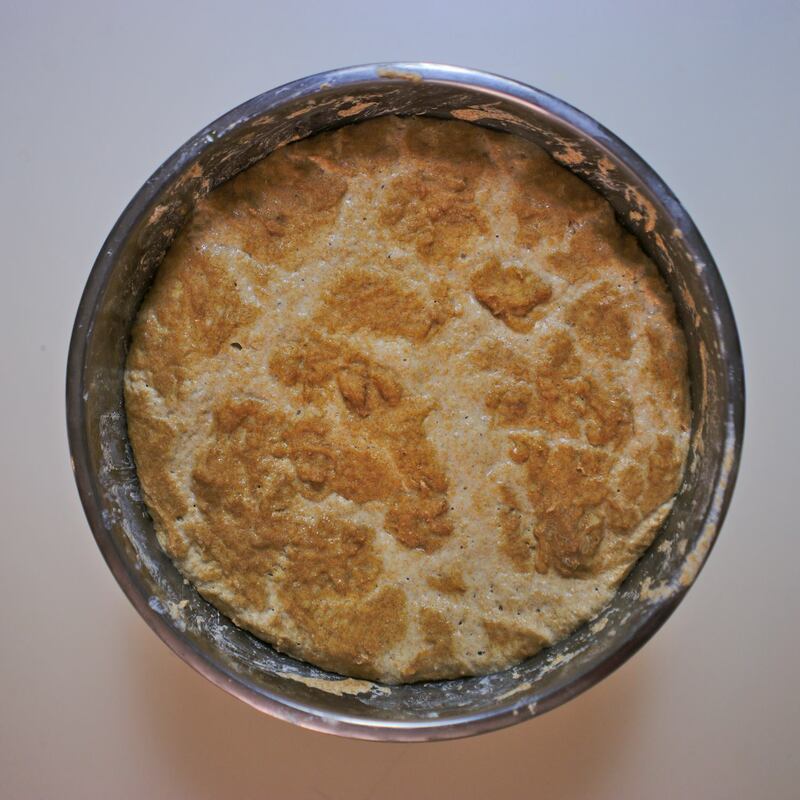 the AP/bread flour in a standard recipe. Make rolls instead of pretzels guided by a pretzel recipe. The extra rise comes naturally. Oh, OK, I already bake "regular" spelt bread, so nothing new. I will have to start calling it Dinkel-Laugenwecken which sounds so much more impressive! I like the rolls idea, I'll give that a try. I was actually just about to try some sourdough pretzels. Thanks! I recognized this bread immediately (having also lived in Stuttgart)! Any chance you know how to make Rublibrot? Good evening Smo: Reading your post about 5 days ago , I was very intrigue and want to try it . So I gather all the materials and baked it last night . I followed your recipe to A" T" with not looking and cover it until the next day which is this morning. I was vastly disappointed because it was the ugliest bread I have ever made and I am not a novice since I had baked with sourdough for more than 5 years and did pretty well. The only thing I did not have is your Pullman type loaf. I used the regular bread pans and covered it during bake with baking sheet pan weight down with the lodge cast iron pot. My sourdough starter was well fed and it was doubled within 3 hours on that day. The first time which I think that there may be something wrong was when I pulled my dough out of the refrigerator after 9 hours and notice that the dough had not rise at all!!! You mentioned that your dough was almost doubled. I left it for 40 min. at room temp. and then went into the oven . I put my loaf on the stone with a steam per your suggestion. My breads this morning was not rise at all . It is about 1" tall and very hard. The taste is not bad ( I gave it 6 point out of ten) but I have to toasted them to make it taste better. I have no idea how this bread suppose to taste like but I know what it suppose to look like after looking at your picture. The spelt flour is very expensive at my supermarket but then it is organic. It is almost $6.00 for 1 lb. bag. I would like to make it again but I am sort of scared that it might not turn out good again. What do you think that I did which was wrong? Thanks.